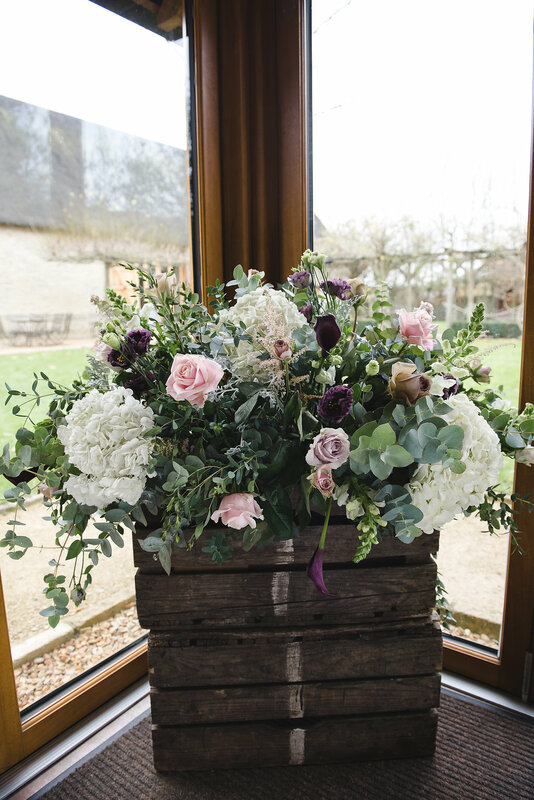 Fiona and Ted's stylish winter wedding flowers at the Tythe Barn, Launton, Oxfordshire - Joanna Carter Wedding Flowers | Oxford, Oxfordshire, Berkshire, Buckinghamshire and London. 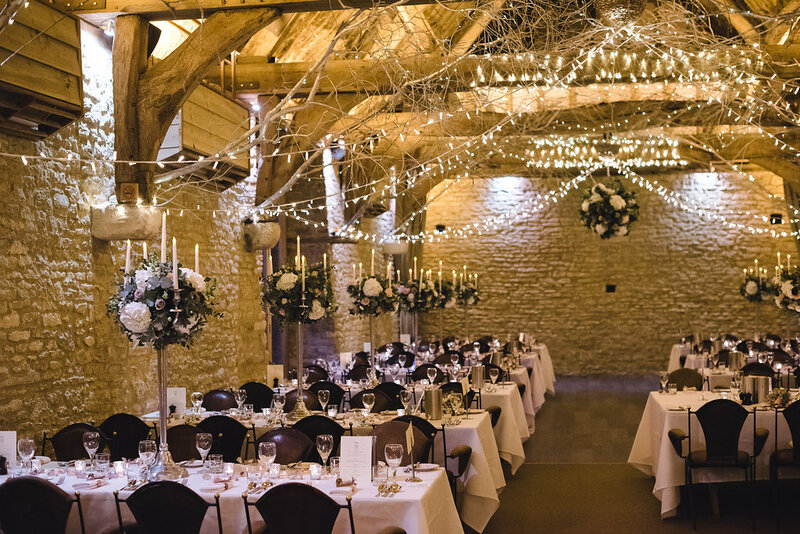 Ted and Fiona created a stunning fairy light filled setting for their elegant wedding reception at The Tythe Barn in Launton, Oxfordshire. 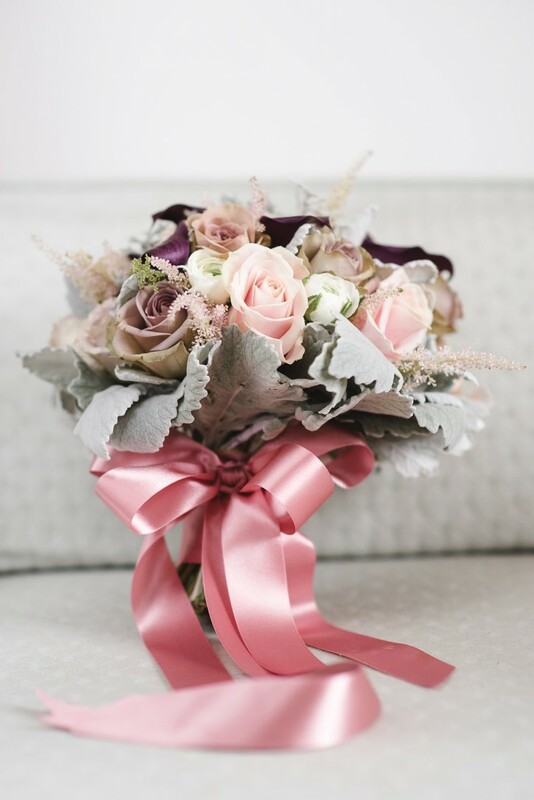 They chose a mix of deep plum, soft pink, ivory and soft icy grey which gave the whole scheme a gorgeous wintery frostiness. 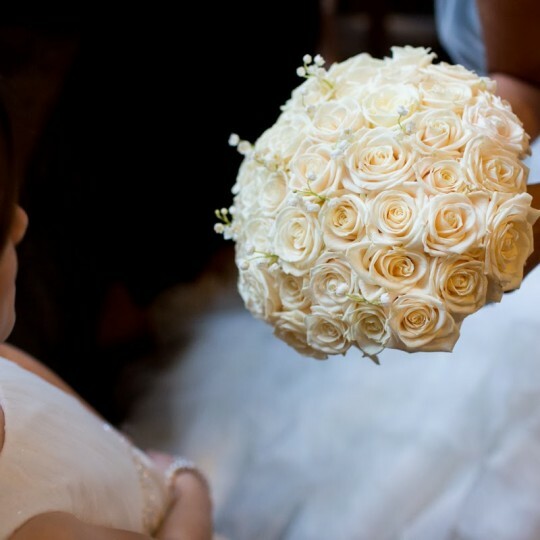 This was the last of 4 weddings this year that I have worked on alongside Nicola and Glen from www.weddingsbyNicolaandGlen.com They are fabulous photographers and have captured every wedding we have done this summer just perfectly! 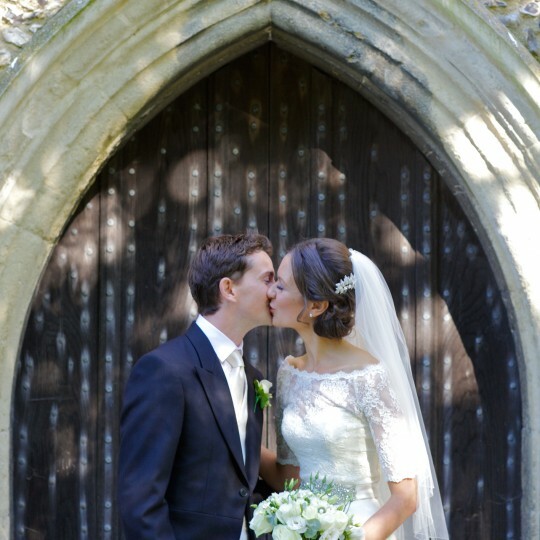 Their ceremony was in the local Church of St Mary’s in Launton, just a stones throw from the Tythe Barn. 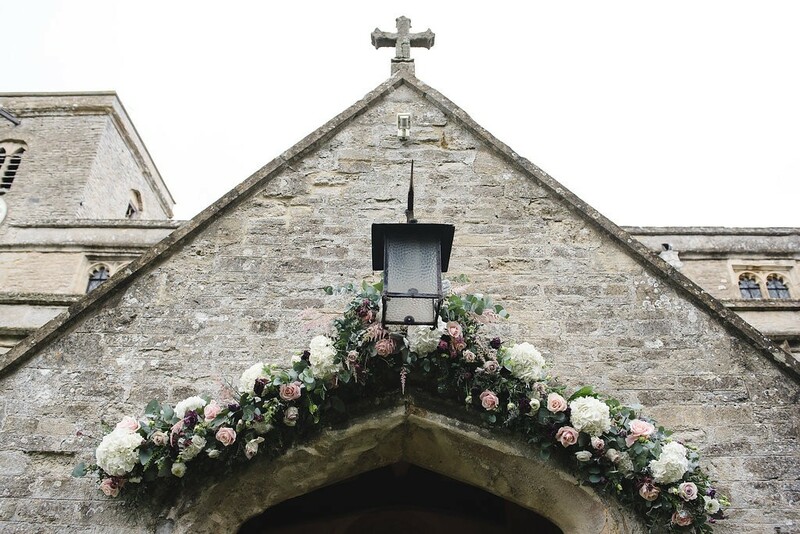 We decorated the outside of the church with a beautiful archway swag which made a lovely backdrop for photos. 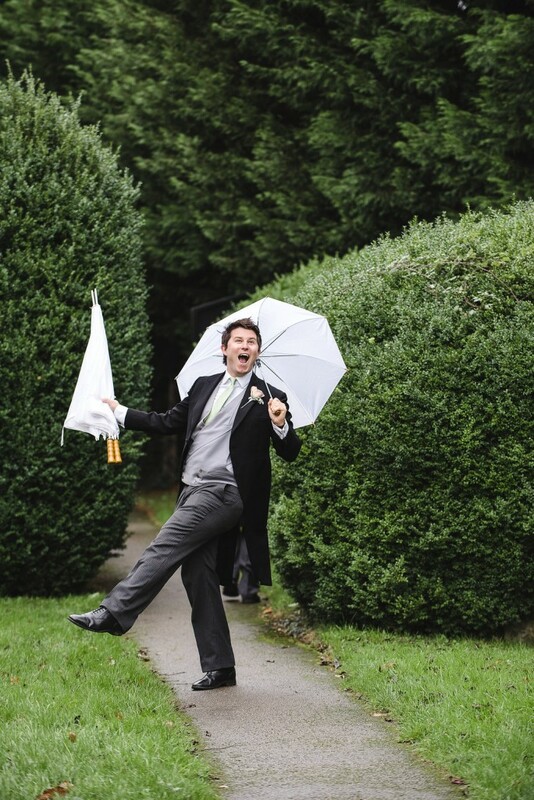 The ushers were ready for the rain but luckily it held off until after the wedding and meant Ted and Fiona could have some photos outside before heading in to the twinkly lights off the Barn. 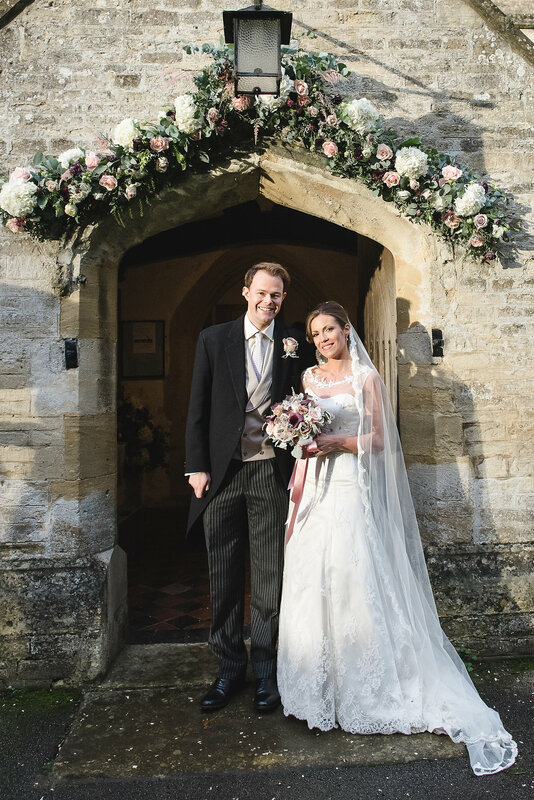 After the ceremony and some churchyard photographs, the guests were all able to walk back to the Barn from the church along the country lane. 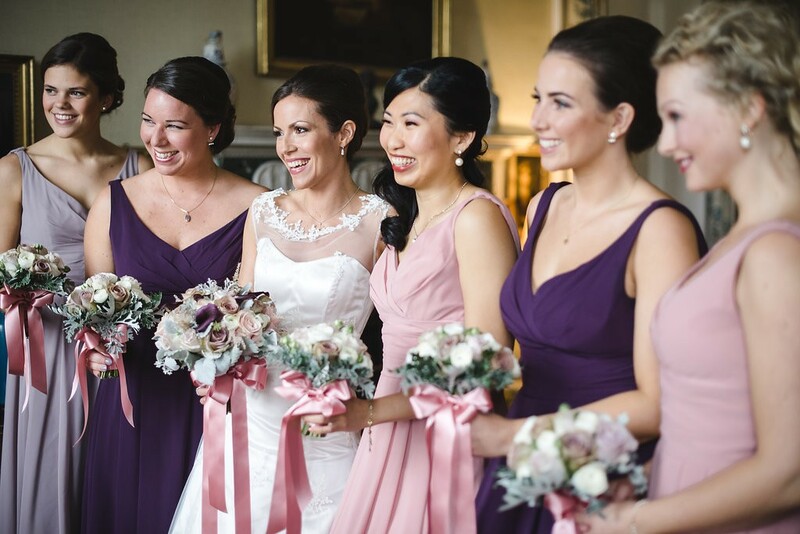 Fiona’s bridesmaids wore 3 contrasting shades of pink, plum and soft grey so we gave them all matching bouquets in soft pink ivory and grey shades. 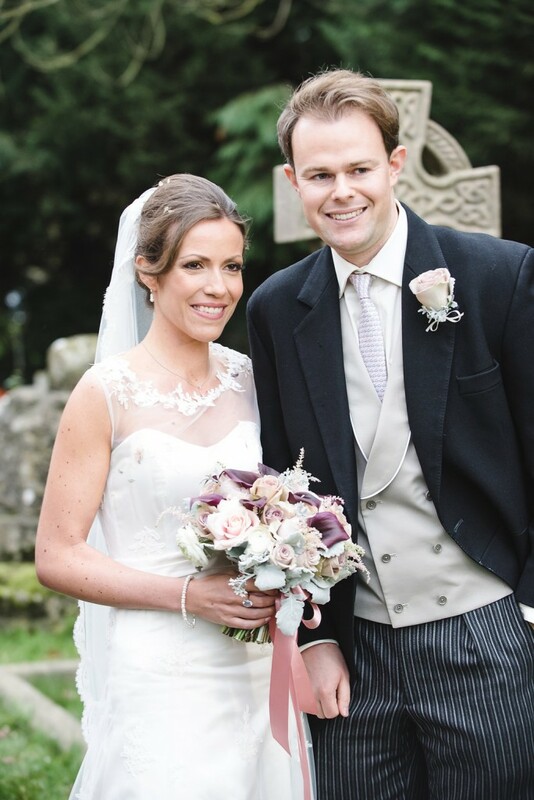 We added deep plum cala lilies to Fiona’s bouquet for contrast. 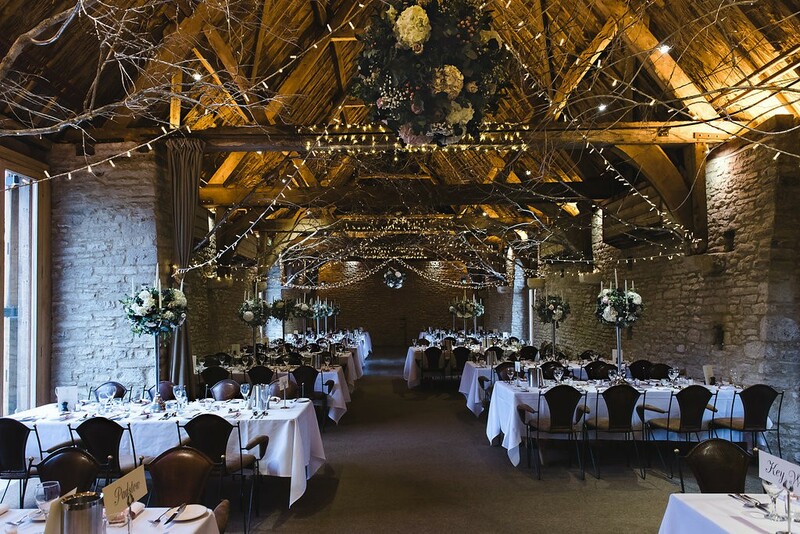 The Tythe Barn had been beautifully decorated for winter with icy white birch branches in the ceiling and a lovely canopy of fairy lights woven in amongst them. 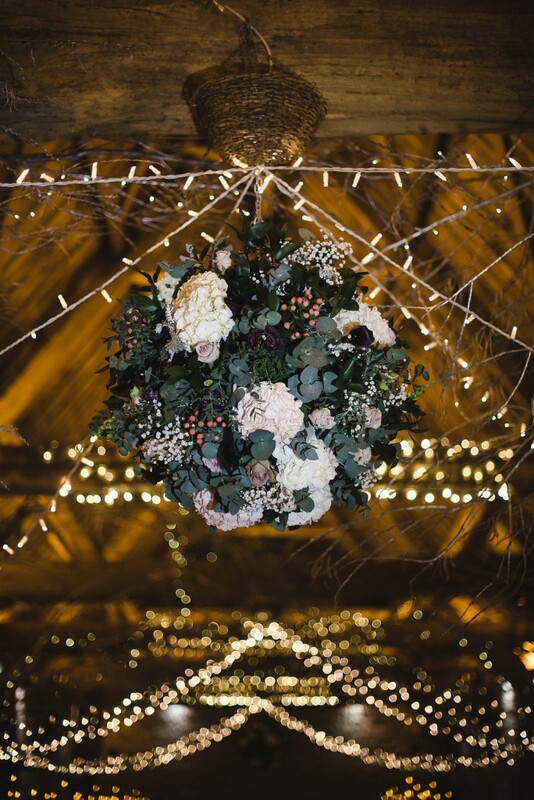 We added large balls of flowers hanging from the beams. 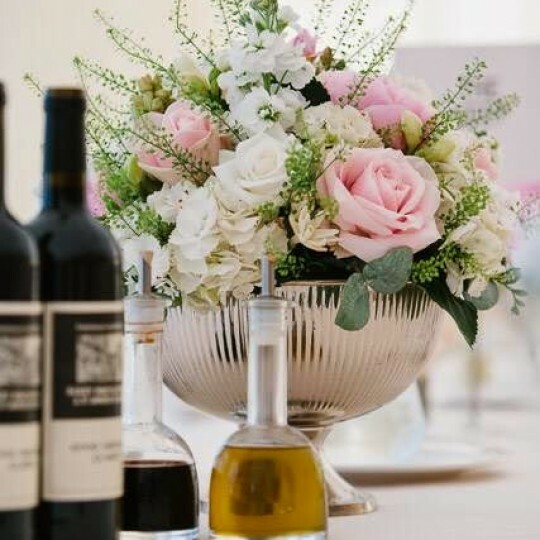 On each guest table we placed a tall silver candelabra with a large ball of hydrangea, cala lilies, roses, lisianthus and eucalyptus foliage. The candles added to the lovely twinkling lights throughout the Barn. 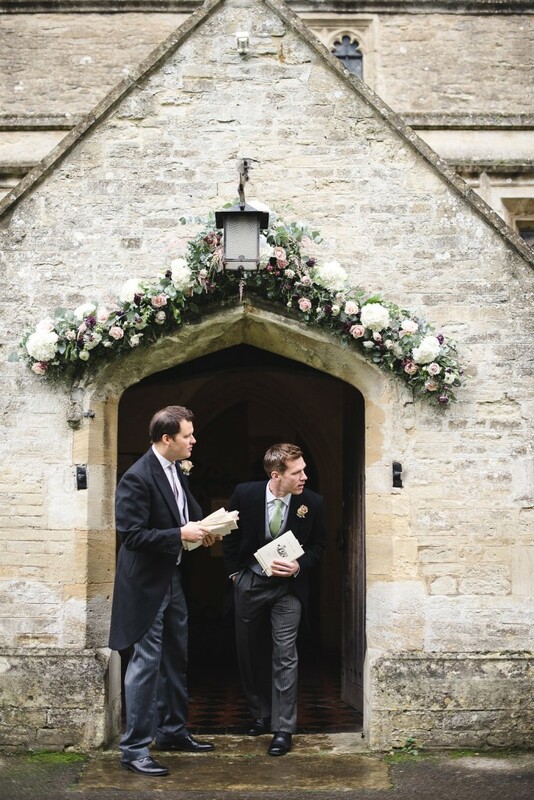 In the bar area we placed large vintage apple crates full of flowers to greet guests as they arrived back from the church. 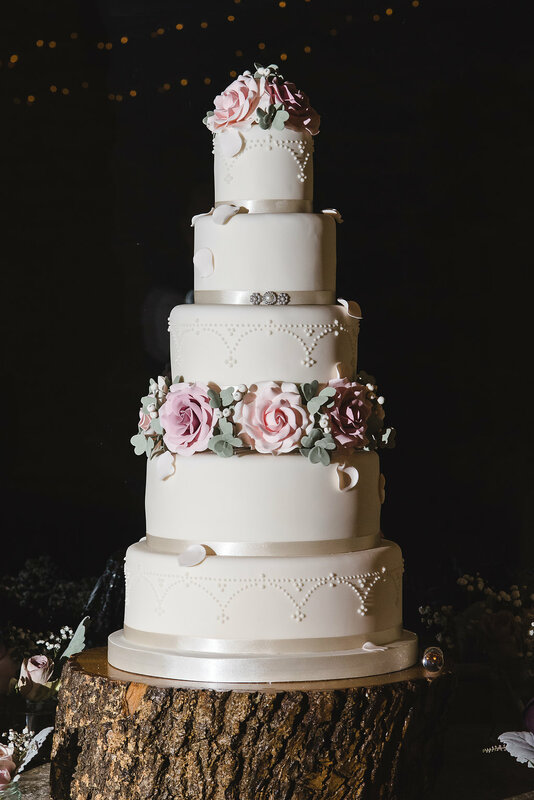 The stunning cake was made by www.cakebyrachel.co.uk another brilliant wedding supplier we have worked with on lots of weddings this summer. 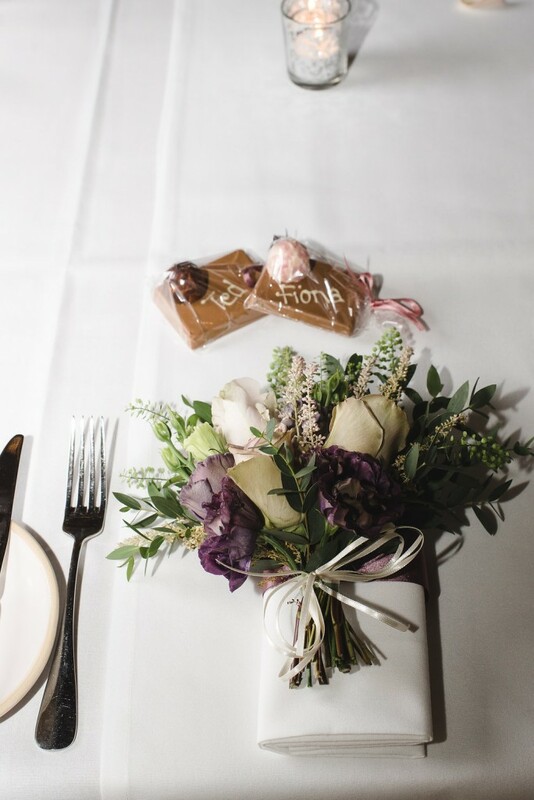 On the Bride and Groom’s napkins we placed small tied clusters of flowers as a surprise. We loved the colour scheme Fiona and Ted chose and were thrilled with the overall look in the Barn once all the flowers were in place. Thank you Ted and Fiona for letting us be a part of your wonderful day.